To Our Shareholders | SHIP HEALTHCARE HOLDINGS, INC.
Our growth and progress is a never-ending process. We wish to express our gratitude to all our shareholders for their continuing support. In April 2018, to mark progress on the path toward our long-term goal of one trillion yen in consolidated net sales, the SHIP Healthcare Group launched its SHIP VISION 2020 medium-term management plan. This plan calls for sustained high growth and the flexible and resilient management foundations needed to support this growth, setting goals of 500 billion yen in consolidated net sales and 21 billion yen in ordinary income for FY2020, its final year. In the roughly half year period since the plan was launched, we’ve made steady progress on each of the plan’s measures. By successfully completing this plan, we plan to achieve continuing rapid growth. The business environment in which the Group operates is currently undergoing large-scale reforms intended to establish sustainable medical and long-term care systems. Background factors include low birth rates coupled with an aging society, the aging of the baby-boom generation, and the financial state of the national and local governments. 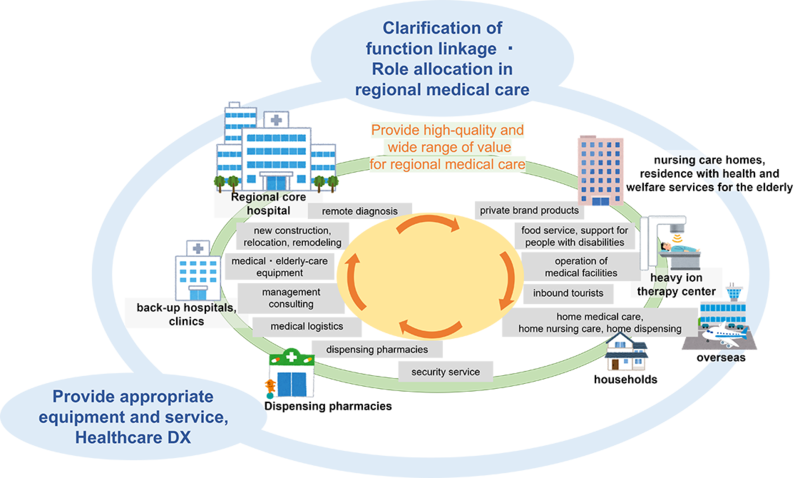 The backbone of these reforms consists of “regional medical care plans” and “regional comprehensive care systems”. In both areas, reforms are underway to coordinate care across entire regions based on cooperation among medical institutions, long-term care facilities, dispensing pharmacies, home-care service providers, and other parties. At the same time, economic development overseas is generating demand for advanced medical care. Opportunities are growing worldwide to take advantage of these advanced technologies and the expertise of the Japanese medical care system. Sustained future growth will likely be based on rapid adaptation to changing domestic markets and advances into overseas markets, where opportunities are growing. Under these conditions, as a social innovator, the Group will strive to build optimal regional healthcare networks while taking on the major social challenge of determining the forms medical institutions and services should take. In accordance with the Group’s mission of “Creating environments for medical professionals,” we will implement management that highlights our ties to local communities while striving to realize improved medical environments. Conditions during the second quarter point to a harsh business environment. Simultaneous reforms in April of medical and long-term care compensation systems significantly reduced drug prices and refunds for medical materials. 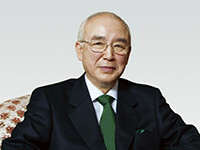 Nevertheless, thanks to the contributions to business performance of recording some large-scale projects ahead of schedule in the Total Pack Produce (TPP) business and steady growth in numbers of tenants in the Lifecare (LC) business, among other factors, we achieved year-on-year growth of 7.8% in net sales (202.1 billion yen). In our international businesses and heavy ion therapy facilities, sustained cost-saving efforts offset expenditures on advance investments, resulting in 3.8% growth in operating income and 10.2% growth in quarterly net income attributable to owners of the parent. We plan to make every effort to achieve the goals of the medium-term management plan launched this fiscal year. 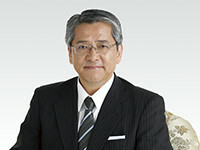 In light of the plan’s emphasis on strengthening returns to shareholders, we purchased 3 billion yen in treasury stock this year. The healthcare industry today is undergoing dramatic transformations, including a shift from individual facilities to “a regional focus”. These transformations are driven by the promotion of regional medical care plans and regional comprehensive care systems and increasingly harsh conditions for hospital management and competition spurred by new industry players, including companies from other industries. The Group is responding by improving productivity and enhancing Groupwide coordination. In response to regional medical care plans, we are strengthening our business foundations through partnerships intended to enhance services while integrating services already present within the Group. These measures reflect the need for ever wider-ranging knowledge and expertise. In response to intensifying competition, we are strengthening productivity by harnessing IT to enhance efficiency throughout our businesses while simultaneously implementing everyday improvement activities Groupwide. To build flexible and resilient foundations, we will strive to develop and train human resources while promoting comprehensive governance and risk management within the Group. This year, the first fiscal year of the new medium-term management plan, we are seeking to establish the foundations for future growth. In the Total Pack Produce (TPP) business—a core business—we are making progress on rebuilding the corporate constitution required to provide sustained and reliable products and services that meet market needs. We are also strengthening our expertise to adapt to dramatically changing market structures. In the Medical Supply (MSP) business, we are moving ahead with efforts to secure competitive advantages through benefits of scale and by establishing areas in which we hold a dominant position. In the Lifecare (LC) business, we have launched a collaborative promotional campaign featuring the Hello Kitty media character at Wellhouse Senrichuo, a facility operated by Green Life Co., Ltd. This campaign is intended to differentiate our long-term care services and help secure and develop human resources. We’re also making progress on establishing foundations for the Healthcare Service (HS) business, which we intend to position as a fifth core business. Related efforts include opening the Osaka Heavy Ion Therapy Center in March of this year and beginning to provide treatment there in October, as well as steady progress on overseas projects. While our efforts to realize the medium-term management plan have just begun, they are already generating steady results.